We have seen the usage of Office Assistant for Message Boxes and Message Box with Options Menu in the earlier Article. Like I said before, when we design Applications there must be something different in it better than what we did earlier, better and attractive to the User as well as to the outside world. Data processing has its own importance and I am not overlooking it here. Every Application that we develop is different and have challenges in its own merit and we have to devise new methods or techniques to deal with the issues in them. But, repeating the same type of Application design and using the same kind of controls like the Command Buttons or Message Boxes over and over again is a boring experience, to the developer and to the User as well. I think that is one of the reasons why Windows or Microsoft Office Applications comes out with more features and better looking Programs all the time. If you have not tried the earlier example please read the Article on MsgBox with Options Menu and go through the preparations that I have mentioned there, in order to run the programs given here without errors. Open the Form OptionCheck that we have created in the earlier example in design view. Click on the Command Button to select it and display the Property Sheet (View -> Properties). Change the following property values as given below. While the Form is still in design view, display the VBA Module of the Form (View -> Code). Copy and paste the following Code into the VBA Module of the Form and save the Form. OptionArray(1) = "Display Report Source Data"
msg = "Please Select an Option"title = "Report Options"
Me! [optTxt] = i & " : Cancelled"
msg = "Display Report Source Data"
This is a copy of the same Program that we have used for Baloon Type Options which is already there in the Form Module. I have made changes in two places in the Code to use it for this example. Number of elements in the OptionArray() Variable reduced to three after removing the Cancel item, because the OK and Cancel Buttons will be included in the main program. Included testing for the Cancel condition in the Select Case . 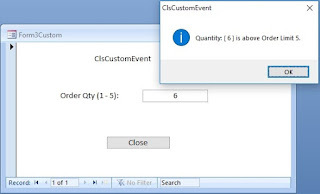 . . End Select statements and terminates the program if the User clicks on the Cancel Button. When you implement this method into your Project you can remove the Case -2 and next two statements underneath it. Here it is inserted for demonstration purpose only. Copy and paste the following main program into a Global VBA Module in your Project and save it. strText = "Select only one item. " strText = "Select one of the Options or Click Cancel! " put check marks in more than one item, if so, forces to select one item only. clicked OK Button without selecting any of the Options. If so, asks to select one of the options before clicking OK Button and suggests clicking Cancel Button if there is a change of mind. If the office Assistant is not visible, turn it on, Help -- > Show the Office Assistant or press Alt+H followed by Alt+O. Right-Click on the Office Assistant and select Choose Assistant. 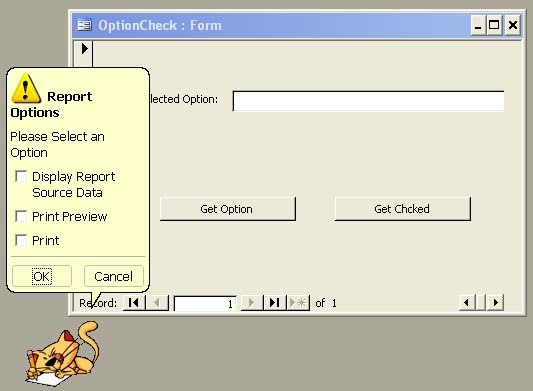 Click on the Next or Back Button to select the Office Cat Character. The program works with any Office Assistant Image but the initial Animation Type: msoAnimationWritingNotingSomething set in the Program works fine with the Office Cat and I love the Office Cat. 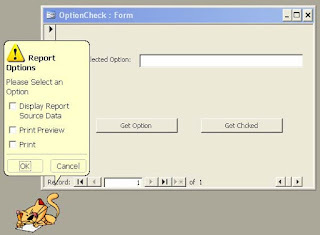 Open the OptionCheck Form in normal View. Click on the Get Checked Command Button. If every thing went through well you will see the Office Assistant with Check Boxes as shown in the image at the top. Try clicking the OK Button with check marks in more than one item. Try clicking OK Button without putting check mark in any of the options.